From the casual and intimate to the grand and elaborate, the team at Dockside are on hand to discuss, organise and plan your event. They pride themselves on ensuring everything runs seamlessly and stress-free so that you are able to soak up the ambience of the venue, and enjoy the company of your nearest and dearest. Extensive menu choice, customised wine lists, sound, table settings and other personalised details can all be arranged in advance to ensure your event is unique to you and delivered exactly the way you want. Equipment: Sound system, handheld microphone, projector, 55' plasma. The timeless and versatile nature of this waterside deck area makes it a suitable choice for any occasion - from a cocktail party to a sit down dinner. 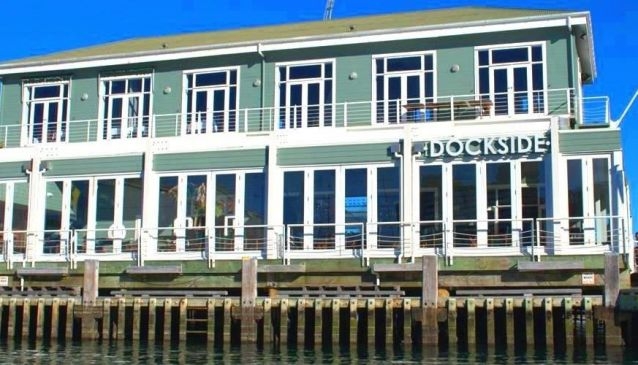 The classic wooden floors and tables, fireplace and retractable roof make this a haven to shelter from the weather if necessary, or, when the sun is shining, and the roof opens, the panoramic views of Wellington harbour and open air feel make this a superb summer spot. Equipment: Stand alone sound system, radio microphone, projector. This space is on the third level and provides elevated views of the city and sea with two private balconies. The high ceiling, gleaming wooden floors and walls give the venue a polished, sleek look. The private bar makes this an exclusive spot for a large gathering. Perfect for working lunches, meetings, sit down dinners and intimate get togethers, this small but elegant space is a private atmospheric alternative to a traditional work space, or busy restaurant.